Incentives are a great way to attract the public’s attention towards a fundraising event. There are many easy incentives that can be used to say thank you to donators that should not eat greatly into a budget. 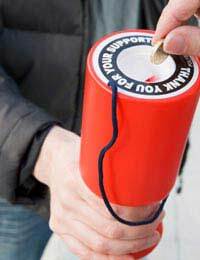 Fundraising incentives can help to catch the public’s interest and increase donations. Incentives are a way to say thank you to donators, and the actual incentives themselves do not need to be expensive. Gifts, prizes and sponsorship adverts are all popular incentives. Badges and stickers are also easy incentives to provide to donators during face to face fundraising. There are companies that will provide fundraising incentives with the fundraiser’s company name printed on the actual gift. Prizes are one of the easiest incentives to give to donators. They can take the form of raffle with a prize given once the fundraising event has ended. Using a raffle means that every donator has the right to win the prize no matter how big or small the donation. This is also a good way to bring donators to an event if the raffle is held during a fundraising event. Prizes do not need to be expensive and can actually cost nothing if a sponsor has donated a product during the fundraising campaign. Naming donators on a fundraising website is an excellent incentive that will not cost fundraisers a penny. This form of incentive is usually provided for major donations given by businesses. Local businesses will usually be happy to provide products or financial donations in return for a name check on a fundraising website. There is actually nothing to stop fundraisers name checking anyone who donates to their cause. Donations made online usually come with the option for the donator to place their name next to the amount they have given. Small gifts can be given to donators and these gifts will not take too much from a budget. Think of small gifts such as pens, USB sticks and key rings. There are online companies that specialise in providing these sorts of incentives for fundraising companies. The gifts can be personalised with the fundraising company’s logo or name. Another option is to give larger gifts to people who do donate over a specified amount during a fundraising campaign. Badges and stickers are two of the easiest and most popular incentives for on the street fundraising. These little gifts are a way of saying thank you for donating, and people do like to show that they actually support certain causes. Children especially love these little gifts and it does have the effect of involving them in good causes from an early age. Think of wristbands, balloons and small games as incentives for children. There are online companies that will provide these incentives and discounts are usually given for bulk orders. It is a good idea to provide incentives that actually relate to the fundraising cause. For example, an environmentally friendly fundraiser can provide gifts such as seed packets or gifts made from recycled products. Fundraisers for health issues can provide incentives such as pedometers or health bars. Charities can be contacted to provide gifts as prizes, and this will not eat into any fundraising budget. Gifts with the fundraising company’s name are also a great way to obtain inexpensive advertising. Fundraising incentives needn’t cost much and the benefits can far outweigh the actual outlay costs. Some incentives such as products donated by companies and used in raffles or auctions will not cost a penny. Incentives are an excellent an easy way for any fundraising company to boost their donations. This is a really usefull site and has given me so many fund raising ideas thankyou.